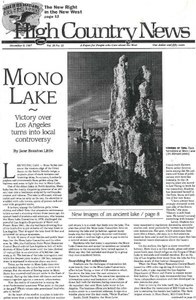 California's Mono Lake has been saved from Los Angeles' thirst, but a new local battle is brewing over the water in the lake's streams, and the question of how far to take restoration of the area. A human rights activist considers the ways in which the "New Righters of the Purple Sage" arrive at and promote their ideas. The Student Conservation Corp. seeks interns who want to work on conservation projects all over the country. Giant fossilized termite mounds are discovered by geobiologists near Gallup, N.M.
Alfred E. Neuman goes West; strange true crime stories; Utah vs. Olympics beer; Utah vs. Rodin; "Jerks in Montana history," D.I.A. and blizzards; suggestions for future. HCN research fund; Herman F. Dieterich; turkeys are gone. Environmentalists appeal a huge salvage timber sale in Utah's Manti-La Sal National Forest, and hope that an agency ruling in their favor proves the salvage logging rider is dead at last. The trees that Weyerhaeuser Co. replanted after Mount St. Helens erupted in 1980 are doing surprisingly well. The Tohono O'odham Tribal Council decides against building a controversial casino on ancient ruins. A dam on the Diamond Fork River goes down, but the Central Utah Project still lives, with a plan to pump reservoir water to farmers, although not to Salt Lake City. Native Americans welcome the return of endangered black-footed ferrets to the Fort Belknap Reservation. In Congress, Democrats and Republicans engage in complicated battles over the Endangered Species Act. The Forest Service puts together a land swap that saves a 530-acre grove of 1,200-year-old trees from logging. The 60-member Wanapum Tribe has never lost its spiritual connection to Washington's Columbia River, and is now hoping to reclaim the only free-flowing stretch left - the Hanford Reach.